Donald Trump, the ‘America First’ salesman, came to Brussels today to demand more tribute to the empire. He wants Europe to buy more U.S. made weapons and to use U.S. liquefied natural gas (LNG). But his arguments are all wrong. The people in Europe are not impressed by them and they will reject his appeals. Well, I have to say, I think it’s very sad when Germany makes a massive oil and gas deal with Russia, where you’re supposed to be guarding against Russia, and Germany goes out and pays billions and billions of dollars a year to Russia. So we’re protecting you against Russia, but they’re paying billions of dollars to Russia, and I think that’s very inappropriate. And the former Chancellor of Germany is the head of the pipeline company that’s supplying the gas. Ultimately, Germany will have almost 70 percent of their country controlled by Russia with natural gas. So you tell me, is that appropriate? I mean, I’ve been complaining about this from the time I got in. It should have never been allowed to have happened. But Germany is totally controlled by Russia because they will be getting from 60 to 70 percent of their energy from Russia and a new pipeline. Now, if you look at it, Germany is a captive of Russia because they supply. They got rid of their coal plants. They got rid of their nuclear. They’re getting so much of the oil and gas from Russia. I think trade is wonderful. I think energy is a whole different story. I think energy is a much different story than normal trade. And you have a country like Poland that won’t accept the gas. You take a look at some of the countries — they won’t accept it, because they don’t want to be captive to Russia. But Germany, as far as I’m concerned, is captive to Russia, because it’s getting so much of its energy from Russia. So we’re supposed to protect Germany, but they’re getting their energy from Russia. Explain that. And it can’t be explained — you know that. 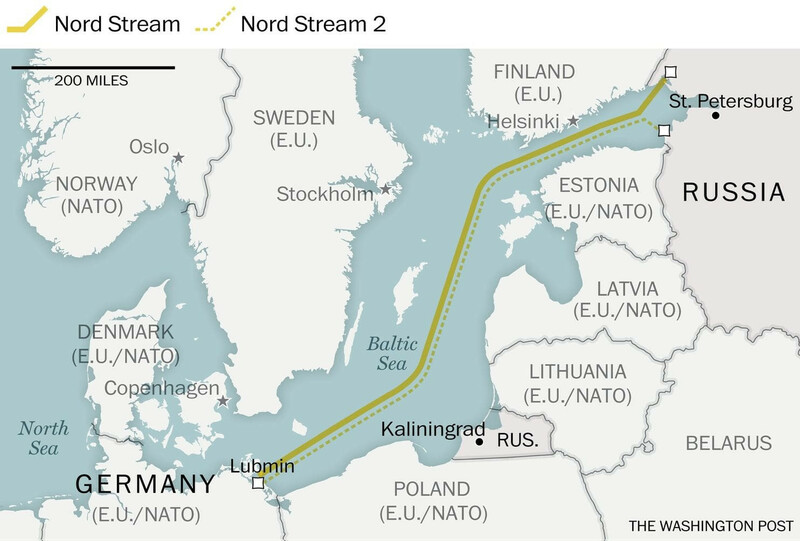 Trump was talking about the Nordstream II pipeline which will supply Germany and other European countries with natural gas from Russia. Nord Stream, I has been operating for a while. Nord Stream II is currently being built by private Austrian and German companies.